Heat therapy and cold therapy are both excellent for treating and preventing injury when used correctly. So when is the best time to ice an area and when is the best time to apply heat? Heat is most often used before workouts and activities to help loosen up the muscles and joints, while cold is best used after a workout to control inflammation. Keep reading to learn different forms of hot and cold therapy and the benefits of each. Ice Packs – Ice or gel packs are a must have in any sports first-aid kit. Ice packs can help reduce swelling around the injury, minimize bleeding into the tissues, control muscle spasm and decrease pain. They are most often used on injuries like sprains. Coolant Sprays – These sprays work fast to numb an area of your body with extreme cold. A cooling anesthetic, skin refrigerants are usually dimethyl ether. The drawback of these sprays is that they only work for a short time. However, they are able to produce a cooling effect faster than holding an ice pack on the affected area. Ice Baths – You may have seen videos of athletes taking ice baths after hard workouts and wondered why. An ice bath helps to flush your body of lactic acid and can immediately reduce inflammation produced after intense exercise. Cryotherapy Chambers – Like an ice bath on steroids, Cryotherapy chambers can decrease inflammation, help rejuvenate cells and reduce signs of aging. For this treatment, you enter a chamber below negative 1000-degrees Celsius for two to four minutes. 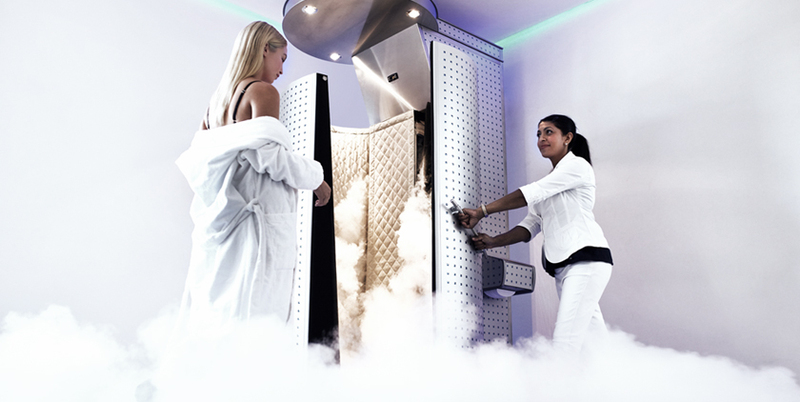 Most modern Cryotherapy chambers use liquid nitrogen to achieve the super low temperatures. If you have a sensory disorder and/or diabetes. Do not use on stiff muscles or joints. Do not use if you have circulatory problems. Heating Pads & Dry Heating Packs – Heating pads and packs are quick and easy to apply but be warned, dry heat can draw out moisture from the body. Saunas – Saunas are great for loosening up tight muscles and joints. Getting a sweat going can also help remove toxins from your body. Steam Room – The hot, moist air from the steam room can open pores, soothe tired muscles and help you to lose weight. Hot Tub – This is perhaps the most indulgent way to relax your body and mind. A hot tub can be used before a workout to warm up your muscles or post workout to relax. Steamed Towels – When applied to a specific area of your body, steamed towels work well with massage and other treatments. When faced with a nagging injury, try warming the area up before exercise with a hot towel. Hot Water Bottle – This old school method is still valid. Most find a hot water bottle beneficial for heating a specific area like the lower back. It is an easy and inexpensive way to get comfort from a little heat therapy. Consult your doctor about heat therapy if you have heart disease or hypertension. Pregnant women should consult a doctor before using saunas, hot tubs or other heat therapies.